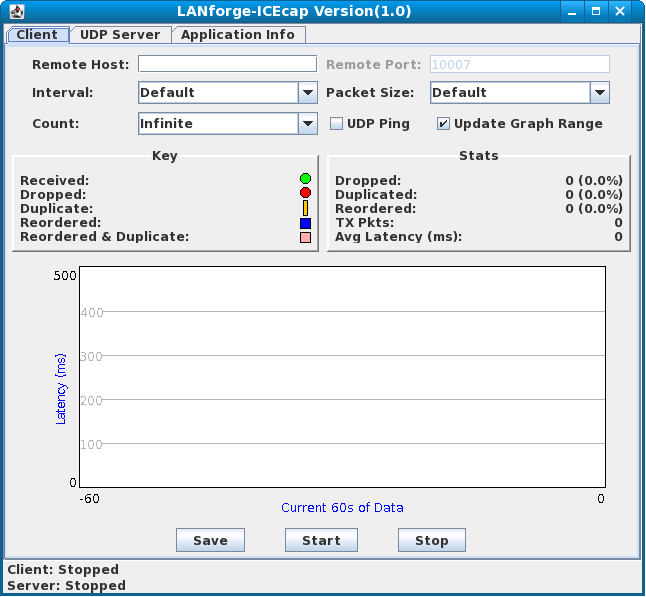 The LANforge-ICEcap feature is designed to allow one to probe any network path and save the results to an XML file. This file can be replayed in LANforge-ICE allowing LANforge-ICE to replicate the latency, dropped packet percentage, and other behaviours of the probed network in a controlled manner. After installing LANforge-ICEcap, you are ready to begin. First, start up LANforge-ICEcap. It should pop up two windows, one being the main window, and another that is the console output for low-level details and debugging output. Unless there is some problem with your test, you can safely ignore the console window. Specify the IP address or hostname for the remote network device to probe. The resulting file will capture the latency and packet loss between the machine running ICEcap and this destination machine. Specify the Network Interface to use on the local machine. Leave this blank unless you know you need to use a specific interface instead of the default interface as selected by the operating system. Specify (in seconds) how long each sample interval is. The samples sent during the sample interval will be averaged together and saved as a single entry in the resulting XML file. Specify (in seconds) how long the ICEcap probe session should last. Specify how many samples (probes) we should send per each interval. Specify the size (in bytes) of the probe packet. Specify the name of the file in which to store the results. The raw data will be saved in <file-name>.dat and the XML file suitable for replay by LANforge will be called <file-name>.xml. If you want to pass any other arguments to the hping2 program, you can enter them in this field. This is not normally required. If you want ICEcap to automatically mail the results to you then specify your SMTP mail server here. ICEcap will attempt to connect directly to this server and speak SMTP in order to send the email. It is likely that your mail server will need to be configured to allow this direct accesss. Specify your email address. This will be used for the 'From' field in the email generated by ICEcap. Specify the email address to which the email should be sent. If this option is selected, the email will be automatically sent as soon as the probe session completes. Un-select this if you do not want to send email. If this button causes email to be sent immediately. Stops a running probe probe session immediately. Exits the ICEcap application immediately. Displays the current progress for the probe session.